The savvy social media marketer, especially those with limited budgets and employees, must think in terms of their specific business. This translates to setting your goals, understanding your audience, and determining the results you seek. To be an effective social media marketer requires a combination of time, quality content and engagement. You can’t expect become an overnight success by just showing up. 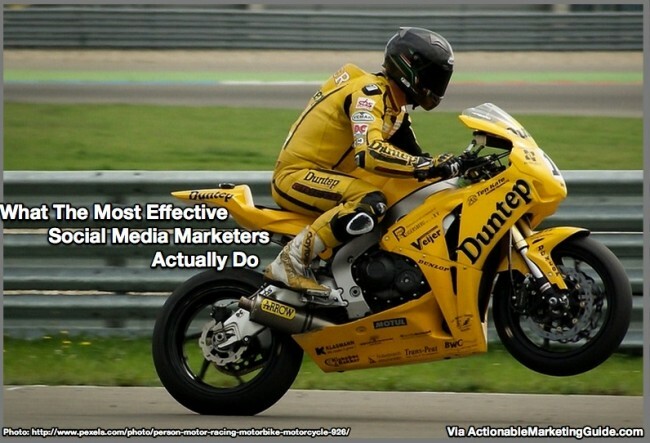 So how do you become one of the most effective social media marketers? 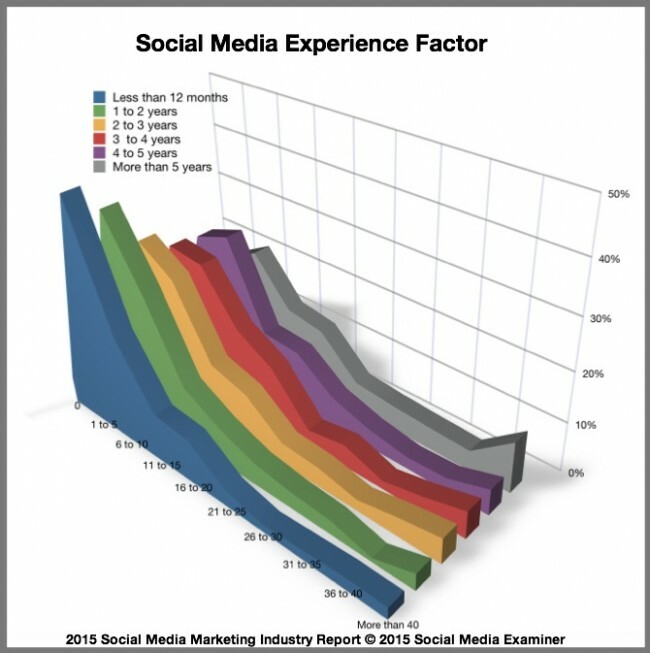 Follow what experienced social media marketers do based on Social Media Examiner’s 2015 Social Media Marketing Industry Report. From it you can learn how to optimize your social media efforts and maximize your results. Caveat: The survey pool consists of 60% of small businesses and 11% are from companies with 250+ employees. Further about 22% of respondents are marketers and PR professionals. Time spent per week on social media is a proxy for experience in this survey. It’s one way newer social media users can increase their expertise. 58% of marketers spend 1 to 10 hours each week on social media. This is the majority of marketers. 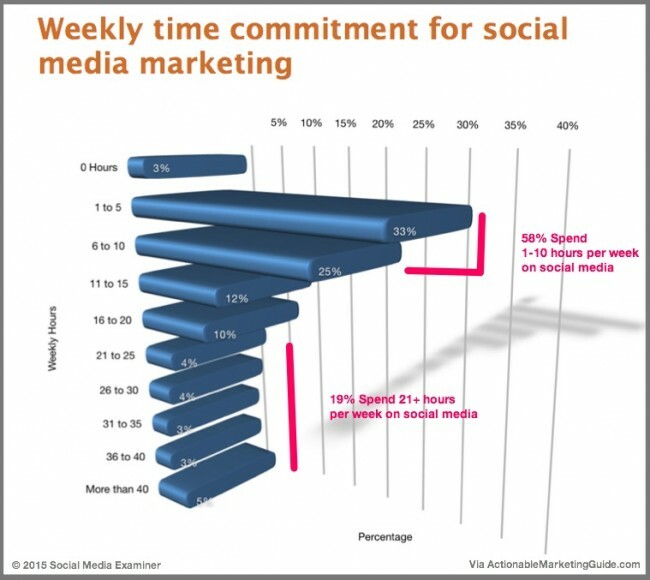 19% of marketers spend 20+ hours each week on social media. To put this into perspective, it’s the equivalent of half a full time employee. 68% of marketers have used social media for at least 2+ years; on average, they’re involved in 6+ social media activities. What this means to become a savvy social media marketer? As marketers gain more social media experience, they spend more time on social media because they learn how to maximize their results. This makes sense since they develop an understanding of each platform and how it can be used to achieve their goals. Facebook, Twitter and LinkedIn are the mass market of social media. Almost all marketers regardless of experience use them to gain visibility. The biggest difference in activity between marketers spending 5 or less hours per week and those spending 40+ hours a week on social media is platform diversity and visual content use. Use Instagram followed by YouTube, Google+, and Pinterest. These image and video based social media sites are great for attractubg participant attention although they may require additional creative time. 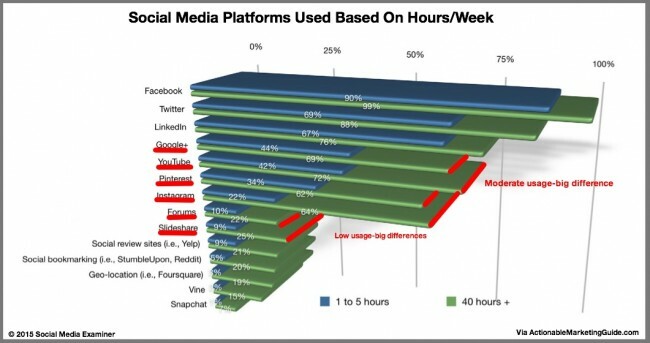 You should be spending 10 hours per week on these platforms to keep up with the average marketers. Boost your efforts—invest 20+ hours to be in the top fifth of social media marketers. Leverage the knowledge of social media experts. Don’t reinvent the social media wheel. Compensate for your lack of experience by using what others have already discovered to reduce your time to success. Integrate your social media marketing into the rest of your marketing plans. Plan your social media content and repromotion to eliminate duplicate efforts and yield improved results with less people and budget investment. Most marketers skip the new, new social media site. They take a “Thank you but I’ll wait and see” attitude. 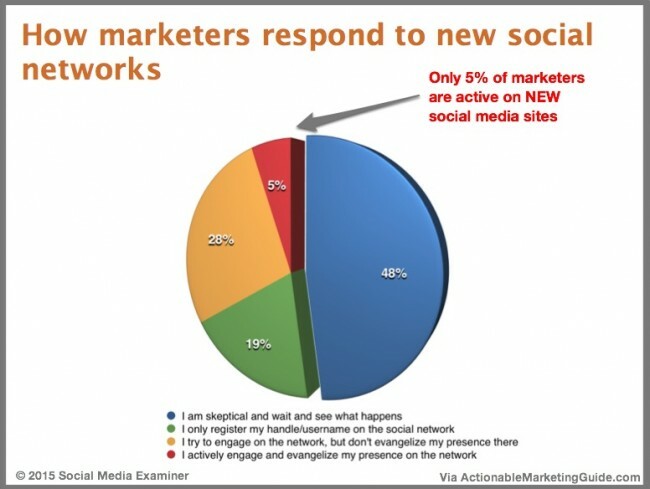 5% of marketers actively adopt new social platforms. These are the power users and social media geeks. Most marketers aren’t on the bleeding edge of any new technology including social media. They often don’t have sufficient resources to maintain what they’re currently doing. 19% of marketers take a name and wait. I’m not surprised marketers are cautious due to the resources involved, but why not claim your name and brands to protect your business if the site takes off? That’s a small time investment that can have a big impact on your brand later. Focus your social media efforts on the existing platforms where your peers have established presences to be competitive before investing in new options. Register your business, brand and personal name on new social media sites. This is a low cost/time investment. It gives you a step up from the competition and allows you to stake out your turf. Social media is key to marketing. It’s the online equivalent of television’s mass reach. As a result, social media increases branding in the form of marketing exposure and drives traffic to marketers. 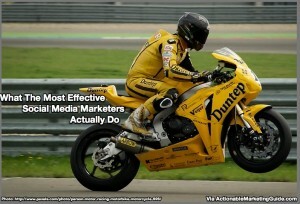 Even marketers who can’t track social media results assume this is true. Yet the most effective social media marketers produce measurable results that achieve their long-term business objectives. Here are 5 key business goals. Note that these 5 indicators either increase revenues (either directly or through shorter sales cycles) or decrease costs. Over half of marketers with at least one year of social media experience generated leads via social networks. Use a contextually relevant call-to-action. Encourage prospects to take the next step. Use different CTAs based on the social media platform. 73% of marketers surveyed who spend 40+ hours per week on social media attracted new business attributable to social media. 49% of all marketers surveyed reported that social media hasn’t improve sales. Ensure that your landing pages and backend systems can maintain the connection with prospects from social media platforms. The problem may not be social media but your team and operations. Use a tailored code to aid sales tracking. Many marketers have issues tracking sales back to social media since it’s usually not the last platform touched. ￼54% of marketers surveyed who’ve been using social media for 1+ years achieve better search results. While this isn’t a direct form of income, it helps reduce your marketing costs. Over half of marketers who’ve invested 2+ years in social media have built new business partnerships. While this isn’t a form of sales, it can speed up sales, improve operations thereby reducing costs. Target people you want to meet on social media. Include thought leaders, customers and influencers. Over half of those spending 6+ hours per week on social media reduced their marketing expenses. Track your fully loaded marketing expenses. This includes employee time, agencies, technology and creative. With careful planning you should be able to find efficiencies. Interestingly, the survey didn’t mention improved customer service and engagement. Customers expect your business to be available on social media. It’s key to the next phase of social media expansion as signaled by Peter Shankman’s book, Zombie Loyalists (2015) and Jay Baer’s book, Hug Your Haters (2016). The bottom line is that incorporating your social media into your overall marketing plans can improve your results and make you a more effective social media marketer. What’s your secret to becoming a savvy social media marketer? Previous article15 Must Have Gadgets For Living Anywhere – Part 3. Next article15 Smart Gadgets To Make Your Daily Life Easier.